Home » video » How to Import MPEG to iMovie like Sony Handycam MPEG-2 into iMovie? How to Import MPEG to iMovie like Sony Handycam MPEG-2 into iMovie? Importing MPEG to iMovie (including iMovie '11/'09/'08), only to find MPEG files are grayed out. Recently, Many Mac users have come across such a problem (for example, cannot import Sony Handycam MPEG-2 to iMovie). Usually, iMovie does allow the import of MPEG files. However, if MPEG (MPG) files are muxed (multiplexed) MPEG-1 or MPEG-2 video, iMovie will refuse to import the MPEG (MPG) files. 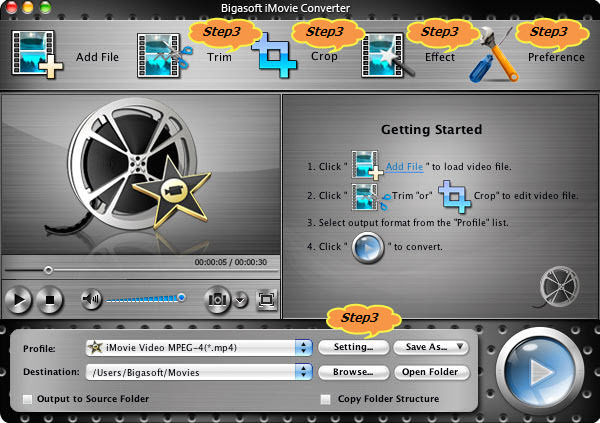 Then you need to use some converter software to convert MPEG to iMovie compatible format for use in your iMovie project. This article will show you how to convert MPEG to iMovie compatible format so as to successfully import MPEG into iMovie, import MPG to iMovie, import MPEG-1 to iMovie, import MPEG-2 into iMovie. 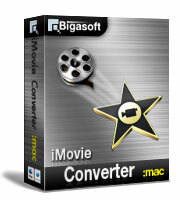 Free download Bigasoft iMovie Converter for Mac install and run it. Click the "Add File" button to import your MPEG (MPG) files. 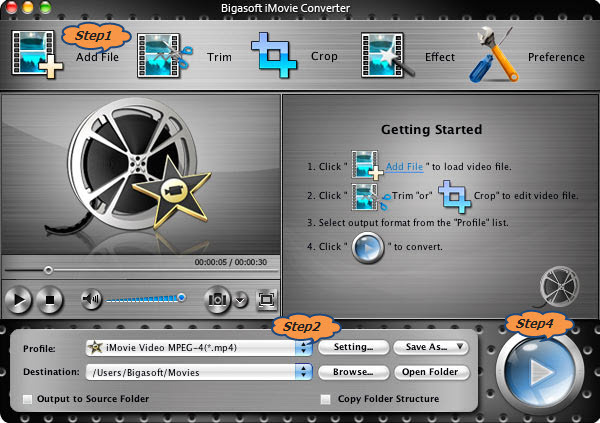 This MPEG to iMovie converter supports batch conversion, so you can also import multiple files at a time. Click the drop-down button on the right side of the "Profile" button to select iMovie compatible format like iMovie Video MPEG-4 Movie (.mp4). If you want the best quality for the output MP4 video, you can choose iMovie HD Video MPEG-4 Movie (.mp4) from the drop-down button. Click "Trim" button, you can achieve converting only your wanted clips by setting the start time and the end time. Click "Crop" button, you can cut off the black edges of the original movie video. Click "Preference" button, you can finish setting output effects, image type, CPU usage and action after conversion done, etc as you like. Click "Settings" button, you can set parameters of your output files such as frame rate, resolution, channels, sample rate, video/audio codec, video/audio bitrates, etc. You can also join several chapters into one by checking "Merge into one file" box. Click the "Start" button, and then your MPEG (MPG) files will be converted to iMovie compatible format soon! 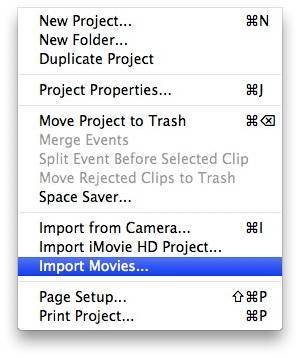 Run iMovie, then click "File -> Import Movies..." to upload the converted MPEG into iMovie. MPEG, short for Moving Picture Experts Group, is a working group of experts that was formed by ISO and IEC to set standards for audio and video compression and transmission. The term also refers to the family of digital video compression standards and file formats developed by the group. And the major MPEG standards include MPEG-1, MPEG-2, MPEG-3, MPEG-4, MPEG-7 and MPEG-12. Why iMovie refuses to import muxed MPEG-1 or MPEG-2 video clips? According to Apple support, when files are muxed, they contain interleaved audio and video tracks (they're mixed together instead of stored in separate tracks). Because of this, iMovie cannot support them. Check for more info: http://support.apple.com/kb/HT1372. How to find if a MPEG file is muxed? Open the original movie file in QuickTime Player. From the Window menu, chose Show Movie Inspector. Note the entry next to "Format". iMovie is a proprietary video editing software application which allows users to edit their own home movies. As soon as you own an iMovie, you can edit and make your videos at will. And then publish them to your own iTunes Library, YouTube or MySpace. However, iMovie is only available with few video formats including DV, DV Widescreen, HDV, MPEG-4, iSight. 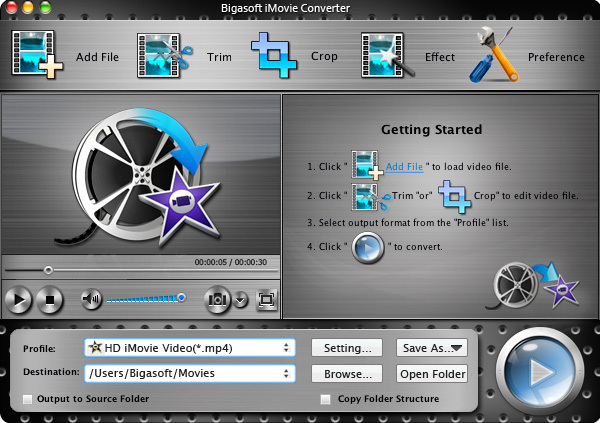 If you want to edit your other video formats, you need to convert them to iMovie compatible formats. It is so easy to import MPEG to iMovie (including iMovie '11/'09/'08) so long as you own Bigasoft iMovie Converter for Mac! Why wait, just free download it and have a try!